Wireless Technology, Inc.'s MACH-V Digital IP Radio is the definitive solution for remote Ethernet connectivity. The MACH-V delivers exceptional performance through all climates, and is a simple, easy and inexpensive installation. The MACH-V is a practical alternative to trenching or recurring costs of leased lines. WTI gives your system flexibility plus unparalleled network security and puts the benefits of WTI's MACH Series Wireless IP into your network. Up to 54 Mbps data throughput. Range up to 50 miles. This model is designed for remote connectivity of IP cameras, megapixel cameras, NVRs or any device requiring Ethernet communication. The radio is flexible and can be configured to communicate in point-to-point, point-to-multipoint or WDS (semi-mesh) mode. This model is designed for the digital transmission of analog cameras (fixed or P/T/Z). The MACH-V Crossover converts a standard analog video signal into an MPEG-2, MPEG-4, or MJPEG format. The MACH-V Crossover also supports all major manufacturers P/T/Z control protocols. The MACH-V Crossover will facilitate the transition of analog systems to the most current digital technologies. 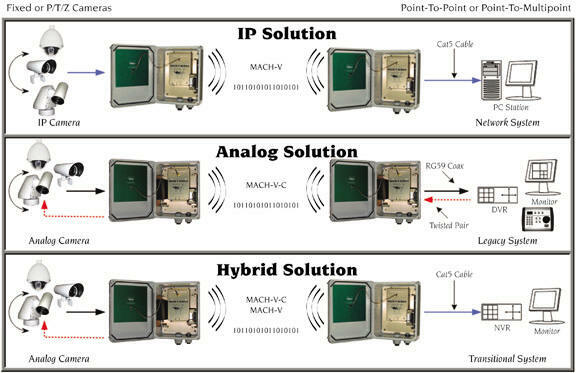 The MACH-V Crossover can be configured to communicate in point-to-point, point-to-multipoint or WDS (semi-mesh) mode.